Thermal cameras have long been marketed as able to "see" when traditional cameras cannot, whether in low light or adverse conditions. Certainly there is much truth in this, especially in low light as our thermal vs D/N shootout shows. But what about when the conditions get even worse? Since it is winter now (in the Northern Hemisphere), we decided to test out how thermal performed during a recent snowstorm. During the storm, the test area in Pennsylvania received 4-5" of total snow, with most accumulation coming during a 2-3 hour period one afternoon. Image quality worsened noticeably as time went on and precipitation intensified. 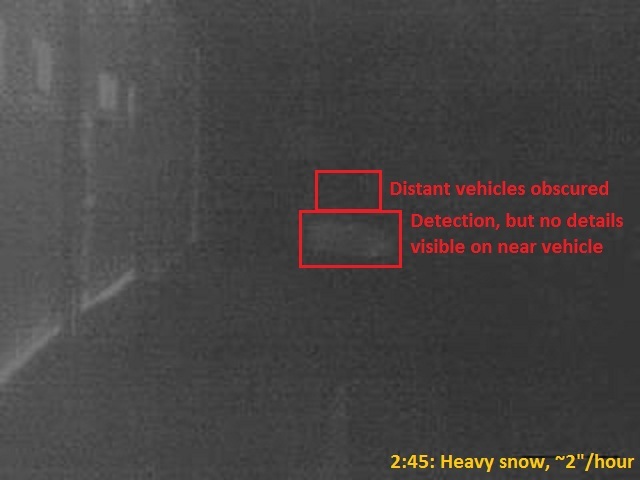 Indeed, during heavy snowfall, the car 300' away that was very clearly discernible essentially disappeared. However, accumulated precipitation, such as snow on the ground, did not reduce thermal performance. 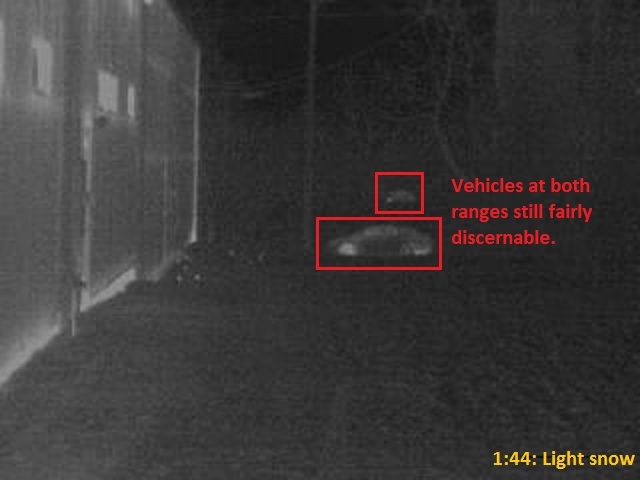 While thermal cameras may be able to detect subjects in scenes which visible cameras cannot, such as low-light applications, users should be aware of the effects weather have on their performance. 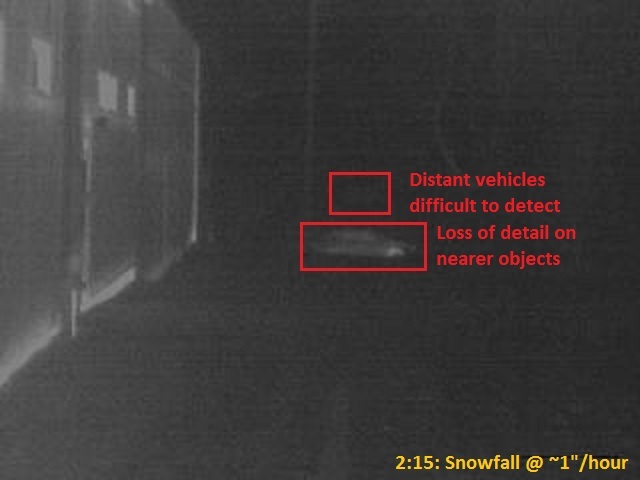 Installations in locations which experience frequent heavy precipitation may find thermal cameras performing below expectations. We shared our findings with multiple thermal cameras who found degraded performance to be expected. To compensate, gain may be increased, but this also increases noise, similar to dealing with low-light scenes in visible cameras. The most reliable solution to this is to use visible and thermal cameras as a complement to each other, instead of individually. A visible camera may be able to reliably detect vehicles in the above scenes, as colors may be more distinguishable than infrared energy under these conditions. As snow began to fall, we can see contrast begin to decrease, though objects are still easily visible. Finally, at the storm's peak (approximately two hours later), the vehicle at 900' is extremely difficult to detect. The vehicle on the near road, about 400' away, is easily detectable, but without details that were discernible prior to the storm. The reason for this reduction in image contrast is a phenomena known as scattering. Simply put, moisture in the air disperses thermal radiation. This results in less infrared energy reaching the sensor, so objects appear closer to the ambient temperature, causing a lower-contrast image. Performance of individual manufactuers may vary somewhat, but in our tests, we have seen a reduction in contrast no matter which camera we used.